Way beyond a "distribution deal," the partnership between Lutron and SnapAV is an ambitious effort to expand the lighting-control universe, and to extend the ecosystem of OvrC-enabled managed services for the home-technology channel. The SnapAV and Lutron partnership might've seemed like a yawner at first glance but it's way more exciting when you consider the implications for OvrC-enabled managed services in the home-technology channel, and the ability for Lutron to grow the lighting-control pie. SnapAV, the super-popular supplier of home-technology products for smart-home pros, recently announced “this deal” with Lutron Electronics, the leading provider of lighting controls for the home-tech channel. CE Pro announced the partnership with much fanfare, and readers offered tentative hurrahs, but they didn’t seem to grasp what the “big deal” was. Frankly, I didn’t either until speaking with SnapAV’s Adam Levy, by title the company’s EVP marketing and customer care, but in practice the co-founder and head guy that makes stuff happen over there. The Lutron and SnapAV thing is a big deal. We’ll get to the implications below, but here are the two highlights, as I see them (and I emphasize I, not necessarily SnapAV, Lutron, or the rest of CE Pro). Lutron is the first and only company to embed SnapAV’s OvrC network-monitoring technology within its own home controller. SnapAV sees Lutron’s new Radio Ra2 Select system as if it were any other OvrC-enabled device built by SnapAV itself. 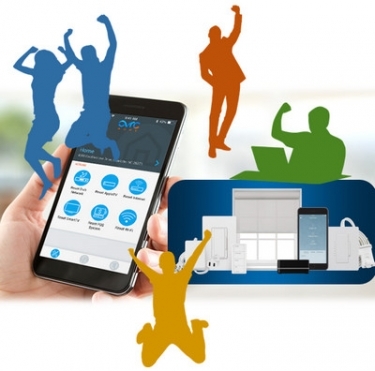 Dealers can remotely access and diagnose the Lutron products, just as they would SnapAV's own OvrC-enabled products like WattBox power management products and Araknis networking gear. Lutron is the first and only company to embed SnapAV’s OvrC network-monitoring technology within its own home controller. This partnership isn’t just a ploy for SnapAV to move more boxes. If SnapAV wanted to do that, it would already carry a boatload of third-party products. Today, it only has that kind of relationship with five companies: Atlona, BenQ, Pioneer, SureCall and URC. No, this partnership is about getting more dealers to sell lighting controls and motorized shades – or more of it they’re already dabbling. The surprise acquisition of Allnet notwithstanding, SnapAV is mostly a serious product developer, as well as a white-label importer, and sometimes a distributor of name-brand third-party products that fill a gap (see #2 above). Big deal for Lutron expanding distribution, big deal for Snap associating with a historical quality brand. … I see this as strategic only. @Lutron gets deep exposure to the “value” market, while @SnapAV gets co-branding with a known leader in high end. Both companies need this. It’s a good business move, the impact on the HTP [home technology professional] is TBD. That seems to be the vibe out there, at least regarding the perception that this is just a distribution agreement (not necessarily Whitaker's characterization of SnapAV as a "value-market" provider). Readers did seem to get the memo that Lutron would become part of SnapAV’s OvrC ecosystem of connected products and services. Here again, though, the response was more muted than I would have imagined. OvrC is a remote network monitoring and management solution that allows dealers to troubleshoot their clients’ systems from afar, and fix many issues before the customer even knows about them. Industry folks probably think OvrC simply wrote a driver for Lutron’s Ra2 Select so dealers could remotely access compatible Lutron lighting and shades. Big whoop, right? OvrC’s immediate competitors like Domotz and Ihiji (now part of Control4) have been integrating with third-party systems for years. Just drop in some Domotz or Ihiji code … and voila you are part of the IoT managed services world. Dealers can troubleshoot the Lutron system remotely, determining for example if a light won’t turn on because the repeater isn’t connecting or if (ooooops) the light bulb might be dead. The thing is: Lutron has no integration like that. In fact – and honestly I had no idea – Lutron’s insanely popular Radio Ra2 lighting and shading controls have no way for dealers to tunnel in remotely and modify programs and settings, no way to monitor the system 24/7 to log activity and analyze blips. Most interventions must be done over the local network, requiring a truck roll to the customer's premises or access to their personal apps. So that’s one thing. OvrC gives Lutron dealers that access. Levy describes a typical scenario that we often hear from Lutron dealers. A client will call just after a RadioRa install and say, "My friend has one button that does all these things. I want something like that." Of course, the dealer can do it, but she would have to get to the customer’s house to make the magic happen. Not anymore. It can be done remotely with OvrC. Dealers can change the programming (“configuring” in Lutron parlance) from across the world, but they can also troubleshoot the system remotely, determining for example if a light won’t turn on because the repeater isn’t connecting or if (ooooops) the light bulb might be dead. In some ways, this should sound like no biggie. Lots of smart-device makers have remote-management solutions that let third parties tunnel in and fix things. Or else these smart devices integrate with a larger home-automation system that takes on that roll. Or … the devices share (or could share) the network with a third-party box built for network monitoring and managed services. But Lutron doesn’t have this, and Lutron isn’t “lots of smart-device makers.” The company is the perennial #1 lighting-control vendor for the top home-technology integrators. OvrC Big Deal #2: The Beginning of ‘OvrC Inside’? Now, those who really thought about this Lutron thing no doubt wondered if this was the beginning of SnapAV’s big push to make OvrC the de facto managed-services platform for the custom home technology industry. Currently, only SnapAV's own connected products incorporate OvrC -- WattBox power management products, Araknis networking gear, Luma IP surveillance systems, Autonomic music management and a few others.Lighting controls would be a compelling add-on to lure dealers and consumers alike to the OvrC platform. It’s a compelling proposition – in fact, so compelling that I just wrote something like a manifesto on the subject for this story but it got to be too long. I will finish it and post separately next week. Levy and his colleagues don’t say things like that just spread to sunshine across the community. When SnapAV solves problems for dealers, the dealers become more successful in their businesses and buy more things from suppliers like SnapAV. It’s a simple philosophy, but one that is rarely put into practice by business-oriented firms – something Levy and I discussed at length and will be the subject of yet another spinoff story. SnapAV is a number-cruncher at heart, and they recognize that dealer happiness might take a long time and a lot of money to attain, but it pays off in the long run. That is a philosophy and business practice that SnapAV shares with Allnet, by the way, the distributor it recently acquired, but we digress. True, he explains, but of the 85% of home-tech integrators who do lighting, fewer than half of them incorporate lighting in more than four projects per year. That suggests there are a whole lot of dabblers who want that business – or get forced into it – but for whatever reason haven’t dived into it. So what’s the really big takeaway from the Lutron and SnapAV partnership? Together they will work to build dealer confidence in lighting. Anyone else tells me something like this? I make those faces Archie Bunker used to do behind Edith's back. But the sentiment happens to be completely true and it’s important, and if you recall, it’s the same reason I went pretty gaga about Screen Innovations’ foray into motorized shades last year. They didn’t just build some really innovative new shading products, they built an entire business model for dealers who were reluctant to embrace the category. They looked at all the key objections and ticked them off one by one – Dealers are afraid of measuring wrong. It’s hard to get shades in straight, and it often takes a two-man crew. They don’t know how to talk about fabrics. They don’t know what labor and materials cost. They don’t even know what products to order. …. So SI provided measuring tools, simple tip sheets, a product design that lends itself to one-person installs, a software platform for explaining fabric options to customers and building simple proposals on-the-fly. They built a complete kit for salespeople to take on the road, allowing even non-technicians to spec a basic job onsite with the client – a job that could go straight into the ordering queue from that site visit alone. Lutron and SnapAV are doing something just like that. In this case, dealers are nervous about calculating loads. Now there’s a simple tool for that. And so on and so on across the long checklist of objections. The duo has spent a long time building on-demand training courses, and SnapAV has performed its usual wizardry on Web-based tools and business processes to drive this very specific mission. SnapAV itself will provide dealer support through its crop of 85 and 30 associates in the customer care and tech support groups, respectively. The fact that SnapAV is doing the hand-holding is a core part of the new business. If you’re nervous about getting into lighting, do you go to this big intimidating leader in the category you’ve never done business with? Or do you snuggle up to the ones who have been there for you all these years and know your needs? Not just the universal “you” of the integrator community, but “you” the specific customer. What’s in it For Lutron? It will be a long process to nurture these lighting newbies, Levy recognizes. It was the same situation with home-networking not too long ago, and the approach paid off. SnapAV is not just trying to siphon sales from existing Lutron distributors. That wouldn't be too hard for the king of process. What good would that do Lutron anyway? Lutron is already the dominant brand in the channel. Everyone knows them. Everyone knows where to buy their products. Why spread the purchases to just another reseller? To really move the dial, Lutron needs to expand the pie. Lutron would have to look no further than SnapAV’s success with Sunbrite TV, the manufacturer of residential outdoor displays it acquired in 2016. At that time, SunBrite owned a dominant slice of the category, but it was a very small pie that wasn’t really rising. SnapAV grew the pie alright, recognizing that growth wasn’t hampered by direct competition in the outdoor-TV category, but rather a different category altogether – indoor TVs. And not just any indoor TVs, but the cheapest of the cheap. Take a decent high-definition display and compare it to a dedicated outdoor TV. The outdoor model obviously looked better in the sunlight and certainly lasted longer, but at what price? An extra few thousand dollars? It wasn’t worth it to consumers, who instead treated their outdoor TVs as disposables, buying inexpensive sets they could replace every year. So SnapAV created product lines that were better than indoor TVs, but not $4,000 and $5,000 better. Whatever the price differential that made the “throwaway TV” sector move up to an outdoor model? That’s the price point SnapAV would reach. And they did, and they’re killing the category, and growing the overall pie. So, doubting Joe Whitaker, what do you say to that, my friend? Still think this …? @Lutron gets deep exposure to the “value” market, while @SnapAV gets co-branding with a known leader in high end. I thought it a little odd that SnapAV would partner with Lutron, given an ample selection of other potential lighting-control partners to choose from. SnapAV works fast. With all its constant data collection and analytics, it can change positioning on the fly. It has become quite a leader in IoT software development and cloud-based services as well. Online is everything to SnapAV and they are smart and nimble there. Lutron, on the other hand, is not so much revered for its fast pace of technological innovation as it is for an unflinching commitment to quality, delivering consistent hits that stand the test of time. They might not crank out buzzworthy breakthroughs like today’s crop of speedy IoT “game changers,” but by gosh their products work well out of the gate and for a very long time … which of course is another form of innovation, just sometimes not the sexiest side. If you’re a company like SnapAV that’s new to the lighting category and has a very large and loyal following of dealers who specialize in audio/video … do you guide them into the lighting category with a partner that delivers a steady stream of whiz-bangery? Or do you put their trust in a company that really knows what it’s doing? Are there any plans to include the regular Radio Ra2 main repeater into the OVRC family? I sure would like to be able to modify customers’ programs without having to roll a truck to do so.